Enormous map of China identifying roads and bridges. Shows early Chinese claim to Senkaku / Diaoyu Islands . 大淸廣輿圖 : 經天合地 : 境域 / Dai Shin kōyozu : keiten gōchi : nikyō jūshishō shii kyōiki. / Enlarged Terrestrial Map of the Great Qing: The Two Capitals, 14 Provinces, and 4 Provinces. A rare and important Tenmei 5, Qianlong 50 or 1785 woodblock map of Qing Dynasty China printed in woodblock. This enormous Chinese language map covers from the Tibet and the Kunlun Mountains in western China to Taiwan and the East China Sea, and from Manchuria to Hainan. The map seems to be focus on transportation routes and identifies important roadways, bridges, and other trade arteries throughout. It also names historical sites and offers numerous annotations at points of cultural or historical interest. The Great Wall of China appears just north of Beijing. Interestingly, the map shows an alternate route for the Lower Yellow River, probably related to a course change associated with one of the frequently floods and notes that the dry river bed is a major travel route (黄河古道). The Gobi Desert appears as a great area extending from Manchuria to western China. West of China proper extensive textual annotations address such things as the source of the Yellow River in the Kunlun Mountains, the 'illiterate' and 'primitive' people of the region, and other cultural or geographical commentary. One of the interesting aspects of this map is that it is strictly limited to China. To the east of mainland China for example, only the Chinese western part of Formosa (Taiwan) is shown. Similarly, the map does not identify the Japanese Ryukyu Kingdom (Okinawa), but does identify the Pescadores or Penghu Islands, correctly situated just west of Taiwan. Another island group, just to the northeast of Taiwan, is identified on the map as Gao Hua (高华岛). This is most likely the disputed Senkaku Islands / Diaoyudao Islands / Diaoyutai Islands / Diaoyu Islands. While the Diaoyu Islands have been administered by Japan since 1895, the recent discovery of oil in the region has made their sovereignty a subject of international debate. They are curranty claimed by Taiwan (ROC), China (PRC), and Japan. The fact that the islands are present on this map offers a historical precedent for Chinese control over the tiny uninhabited archipelago. This map was compiled and published in 1785, or Tenmei 5, or Qianlong 50 by the important Japanese mapmaker Nagakubo Sekisui (長久保玄珠) based upon the 1686 Qing Chinese atlas of Cai Fangbing (蔡方炳, also known as Cai Jiuxia 蔡九霞). Cai's information was updated extensively with new data collected by Sekisui in preparation for this map's publication. This map is extremely rare and a once in a lifetime opportunity for the serious China collector. The OCLC identifies only 2 institutional holdings: Harvard and the University of British Columbia. There is also an example at the National Diet Library in Japan. We are additionally aware of one other example in private hands. Nagakubo Sekisui (長久保玄珠, December 8, 1717 – August 31, 1801) was a Japanese cartographer, Confucian scholar, and sinologist active in late 18th century Edo Japan. Sekisui is considered by some to be the 'Founder of Japanese Geography.' He was born in Akahama village, Hitachi Province, and studied medicine under Suzuki Matuse and Nagoe Nankei. In 1767, he accompanied a delegation from nearby Ishohara village to Nagasaki where, being recognized for his scholarship, was elevated to Samurai status. In Nagasaki he was particularly impressed with his experience of the Dutch and Chinese, for whom he developed great respect. 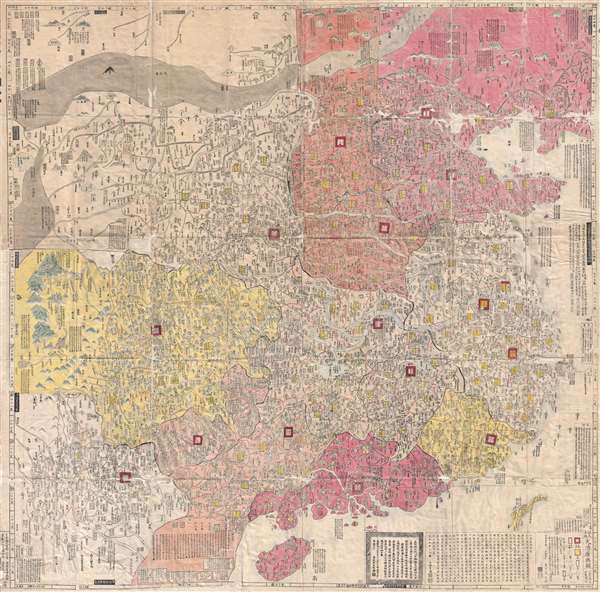 Continuing his travels throughout japan, Sekisui encountered his first foreign maps in Osaka and began remaking Japanese maps using foreign technological advancements. His first map, for example, Kaisei Nihon Yochi Rotei Zenzu (Revised Japan World Distances Map), published in 1779, is the first Japanese map to incorporate a geographical coordinate system. He also issued a world map, Sankai yochi zenzu. (Revised Picture of the 10,000 Nations of the World) based upon the Chinese 1602 Matteo Ricci Map. In 1769 Sekisui became the tutor to the daimyô of Mito Han. He retired in 1791. Sekisui's mapmaking work predates the work of the other legendary Japanese cartographer, Ino Tadataka by some 45 years. Good. Wormholing throughout. Backed on Japanese tissue. Accompanied by original covers.